Several places in Konkan received showers on Thursday 11th night. Highest amongst them was Mumbai Santa Cruz with 82 mms, Canacona Goa with 84 mms and Mapusa Goa with 78 mms. Harnai 58 mms, Panaji saw 42 mms, Ratnagiri 41 mms, Alibag 50 mms and Dahanu 35 mms. Mumbai Colaba asaw 24 mms. On this "spurt" of rainfall, the excitement created in the Konkan and Mumbai region was aroused, and people write of the Monsoon having burst through. IMD announced simultaneously the arrival of the Monsoon in North Konkan on 12th Morning. But, have the parameters been fulfilled ? 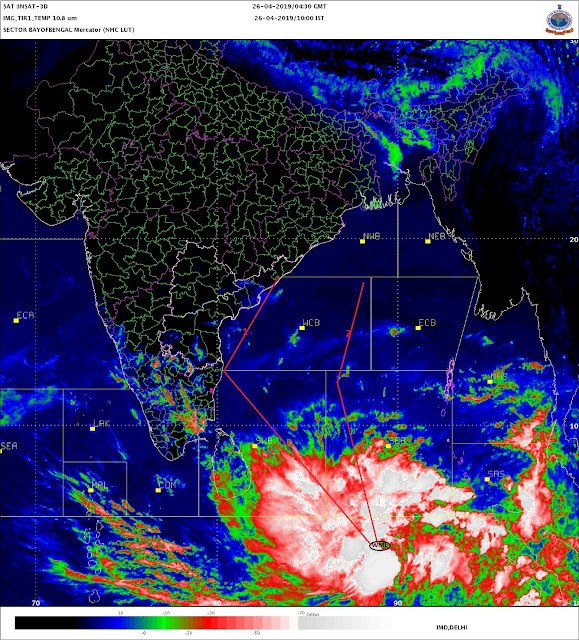 An off shore trough, a strong indicator of Monsoon strength has formed along the west coast from Maharhastra to Kerala. SW winds are blowing along the west coast off Mahartashtra, Karnataka and Kerala at surface level around 30 knts, and even seen at 850 hp levels. What do we see next 2 days. The off shore trough extends upto coastal South Gujarat, but weakens off Kerala. The 700 mb winds DO NOT become SW, and the 200 mb winds restrict the Easterly flow upto South Gujarat Line. Hence, for Mumbai and Konkan, in the absence of a strong "depth" of winds, Vagaries can, after persistent > 5 mms of rain for 2 days in Konkan, forward the Monsoon in the next 24 hrs (On Sunday 13th), but as a weak current. I like the words " Promotion granted, but performance not satisfactory"
Weak Monsoon current will push into South coastal Gujarat next 2 days, along the Surat coastline. Moderate to heavy thunder showers will occur in Saurashtra Peninsula, with Monsoon possibly moving into Coastal Southern Saurashtra. The 200 mb level jet streams are easterlies South of the 20N line now. But, a High pressure ridge, at that level, along Central India, may, (I fear) hold the Monsoon progress beyond the mentioned status. Interiors of Maharahtra (Marathwada and Vidharbh) may see Monsoon advance next week, but the initial strength may not be strong. So, what do we have for Mumbai now ? 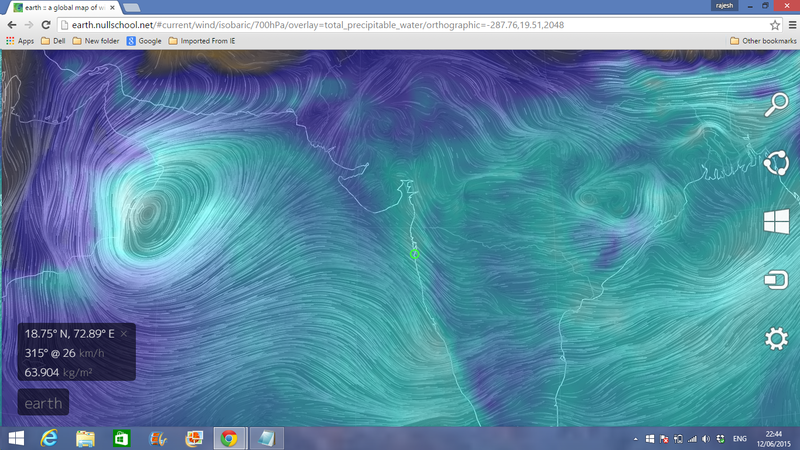 With a weak monsoon set in, Mumbai depends on the off shore trough. As long as the trough holds on, Mumbai will get periods of showers, with daily rainfall not exceeding 15-20 mms per day. This may hold on till Tuesday. I see the trough "crumbling " on 16th. Surat: Monsoon, as a weak current, moving in on Sunday 14th, with the help of the trough which extends upto Gujarat coast from 13th. But, rains and thunder showers in Surat ( around 15 mms/day) decreasing after Tuesday 16th. After a thunder shower on Sunday, we see partly cloudy and dry weather again in Bhubaneshwar next week. Same for Kolkata, after a thunder shower of 20-25 mms on sunday, dry weather for Kolkata next week. Some places in Punjab and Haryana may get thunder showers this weekend. Pakistan will be dry and hot, with the highest around 47c. So when will the current become strong and west coast starts getting heavy rainfall. Like the humour, and that is need of the hour in times of total anxiety. At this moment andamans not getting enough is real worrying!! Praying for the best. Some forecast models predicting heavy rains in Mumbai for next 48 hours. Also possibility of Bay low by next weekend.